My lucky cousin got himself a DSLR that day, and because we were having a family gathering afterwards at my place, he tried out the macro on my miniatures. and WOW. these are his (and my other cousin's) works. I know, I'm not a big fan of the grey background here too, but I'm loving the lighting and the focus! 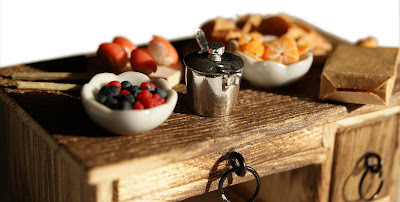 and the focus here isn't on my miniatures, but rather the tiny sugar pot. but the clarity is still amazing! WOW! Your work is simply amazing!!! psst, i got my alley goop! it's WONDERFUL! there was a decent lead time for me to mix it, and it took a tad longer than 6 mins (as promised on the label) to cure, but it cures reasonably flexible! Cindy! :) hahha my cousin would just stare at me blindly if i wanted to swap his camera. and guess what, the other cousin purchased another DSLR too! SHEESHH. $1.6K lar! that sugar pot is pretty right! i purchased a huge amount of stuffs from here --> http://www.minimini-mart.com/catalog/, and that was one of them! OH, i just got what you meant about the swapping. you meant like making a replica right! hahah, damn i'm slow! and btw, very ciao but i just finished sculpting a dslr for one of my customisations actually. hahah. Those are so cute! I just love minatures!